I just finished reading this book and I’m pretty much an emotional mess. So I’m not quite sure how this review will turn out, but I’m just gonna go with and we’ll see. Because somehow, I feel like an emotional word-dump is the best way to give justice to this gorgeous book. And well, to Adam Silvera’s writing in general. Every book I’ve read by him so far has been equally glorious. I don’t typically pick up sad books myself, but even though every Adam Silvera book has me grabbing my tissues and sobbing my eyes out, he’s become an auto-buy author for me. Because he has a unique ability to write these emotional and sad books, but books that still leave you with a flicker of hope in the end and a small smile on your face. The messages in them are deep and often confrontational, but it’s almost impossible to finish one of his books and not feel like a changed person by the end. How do I even begin to describe They Both Die At The End? The blurb and the title say it all. And yet, you’ll still be turning the pages, wondering what’ll happen and if these two boys can still do it. If they can still make it and live past today. But in the end, this story isn’t about their (forecasted) death, but about their life. Their fears, their insecurities, eveything that has been troubling them and holding them back. Mateo and Rufus are both wonderful characters, incredibly written, flawed and realistic but so loveable. Mateo is a precious little cinnamon roll, who’s so kind and nice but afraid of the world and everything in it. Rufus is tough on the outside, but has a heart of gold and is just trying to get by after losing his entire family. Together they form an amazing team, ready to take on their last day. Their connection was beautiful to watch and though their story takes place in just one day, it never feels like insta-love. Just a deep, natural connection. What I also unexpectedly loved about this, were the short chapters here and there from other characters’ POV. Normally I would feel like this would take away from the main story and would just be a distraction, but it really worked. It helped me see how seemingly unimportant side characters still can have an impact on the main plot and also how everybody has their own story going on. It’s definitely been a great writing choice that only added to the story of Mateo and Rufus. The worldbuilding also really worked for me. Though we don’t go into a lot of detail on Death-Cast and how exactly it works, it doesn’t really matter. It’s not about the science behind it. It’s about the life. And even if we don’t get the science, we get a great view on the impact this Death-Cast has on society as a whole and on people’s lifes. And that’s enough for me. Ultimately, this is a beautiful and emotional story about life, death, regret, loss, friendship, love and family. Adam Silvera is a master at crafting these gorgeous stories and I can only recommend them to absolutely everybody. 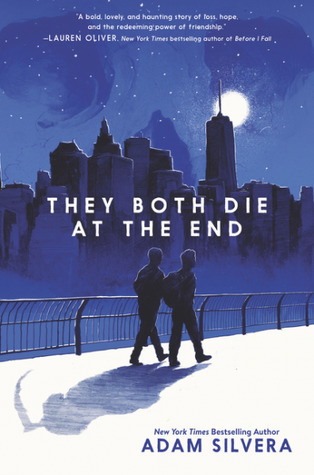 HAVE YOU READ They Both Die At The End? WHAT DID YOU THINK ABOUT IT? I wasn’t sure if I wanted to read this book but you have me really intrigued! Definitely wanna give this author another shot. Oh gosh, this book. I keep seeing it everywhere and every time I read a new review for it, my resolve NOT to read it chips away even further. I can’t handle overly sad books, and my gut instinct was to give this a pass. But like…I can’t? It just sounds SO beautiful and so moving, and even though I’m sure I’ll be weeping by the end of it, I think I need to give it a try. It sounds too amazing not to. Ah, I definitely completely understand! I don’t often pick up sad books either, but there’s something about Adam Silvera that makes it impossible for me to say no to his books 🙂 Hope you’ll enjoy it when you decide to pick it up! Love the quotes that you highlighted. The book seems very strong especially since the characters are well developed. I like that the focus is on the character’s life and not their death. Resh recently posted…‘Miss. Laila, Armed and Dangerous’ Offends Everyone. Yet You Can’t Ignore the Book. You picked some really beautiful quotes! I keep seeing this book around, but I’ve never read anything by this author. However, I do weirdly enjoy sad stories, so this may be one I’ll pick up! Hm… I may have to try this one. Even if the science doesn’t work for me, it sounds like it is done well enough I can ignore inconsistencies. Oh and although I do tend to shy away from sad stories, this one is oddly compelling to me. Brilly review!